Hostel Trustever, you will find an informal and young atmosphere. 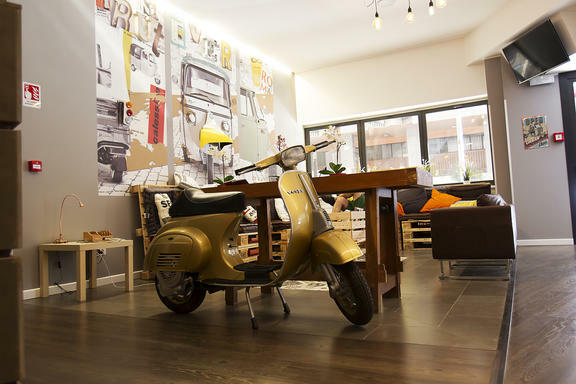 The hostel has a mix of styles like vintage and modern. The hostel has a nice bar, restaurant, a big and coy garden and a large room to relax where you will find a big flat screen. Situated in the heart of Trastevere and at the centre of the famous (Sunday) market Porta Portese. Excellent place to discover the cultural richness of Rome. This modern design hostel has 110 beds in rooms (privates & shared) of 2 to 6 persons. Every room has private bathroom facilities. The hostel offers free Wi-Fi, a 24 hours opened reception, sheets, towel rental, and an interactive app to discover the complete city. The hostel offers also (with surcharge) deposit closets near the reception, luggage storage, self-service laundry and a shuttle service from and to the airports. Near the Hostel there is a swiiming pool(to pay), sauna and turkish bath(to pay), ask at the reception. Near the hostel you can find supermarket, tabacchi, restaurants,pub ecc..
By Train: from Termini station to our Hostel: take the Train to Trastevere Station then the Hostel is 5 minutes walking.